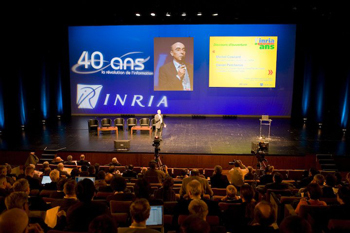 INRIA celebrated its 40th anniversay with a large forum on information and communication science and technologies, and their past, present and future socio-economic impact at the Grand Palais in Lille on 10-11 December 2007. The aim was to analyse and present the 'information revolution' at the turn of the millennium, the genuine upheaval in economic and research activities, in employment organisation and social practices. Over the past 40 years, information and communication science and technology (ICST) has entered every area of social-economic life. It has revolutionised social practices, changed our working lives, sped up economic cycles and imposed new cultural habits and leisure activities. Information technology and software, the Internet and Web, plus a multitude of spin-offs, have developed on a scale never before witnessed in human history. And yet, the public at large has little awareness of the science behind these innovations. The objective of the forum was to launch a debate on society, measuring how far we have come, analysing the changes made and attempting to explain how and why some types of technology have been so successful. Once we have that knowledge, we can look ahead to the near future, anticipate forthcoming changes, define good practices and set into motion new innovations to guarantee economic development in the years to come. 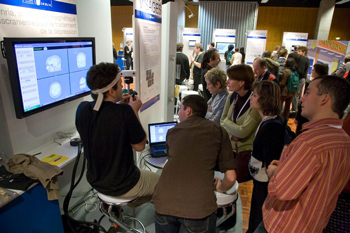 The conferences brought together scientists from all disciplines and key guest speakers. It was composed of four plenary sessions and three theme sessions. The plenary session featured the topics "Computer Science, history in the making", "Digital networks and the development of a new industrial model", "Information and Communication Technologies: change of scale and new challenges", and "New technologies: a cultural and cognitive revolution". Chaired by experts, historians, sociologists and philosophers (Michel Serres closed the forum speaking about cultural and cognitive revolution), the theme sessions focused on various aspects of ICST: historical perspectives, economic issues, societal impact and scientific challenges. The scientific theme session discussed the questions "Is computer science really a science?" with Robin Milner, Cambridge University and Gilles Dowek, INRIA and Ecole Polytechnique; "Computer Science and Biology: a creative convergence?" with Luca Cardelli, Microsoft Research, Cambridge, Jean-Frédéric Gerbeau, INRIA and Jacques Haiech, University of Strasbourg 2; and "What scientific challenges does the future hold in store?" with Olivier Faugeras, INRIA, Bruno Sportisse, Cerea-ENPC/INRIA, and Vincent Quint, INRIA and W3C. The economic sessions focused on the three topics "Has computing transformed engineering? ", "Labels and consumers: the stakes involved in the shopping of the future?" and "From research to business: process dynamics". Speakers included Jean-François Abramatic, Ilog; Patrick Johnson, Dassault Systèmes; Armand Hatchuel, CSG, Ecole des Mines de Paris; Olivier Iteanu, specialist lawyer in information technology; Henri de Maublanc, Aquarelle.com, Acsel; Arnaud Mulliez, Auchan France; David Simplot-Ryl, INRIA; Jérôme Chailloux, ERCIM, Jean-Marie Hullot, Thierry Pollet, Alcatel-Lucent. The third session discussed society-based topics such as "Surveillance society  the reality of tomorrow? (Barbara Cassin, CNRS, University Paris 4, author of 'Google-moi', Sébastien Canevet, specialist in Internet law, Alex Türk, French Senator, CNIL); "The individual in network: new cultural practices?" (Eric Bruillard, University Paris12, ENS Cachan, Jean-Pierre Dalbera, French Ministry of Culture; Patrice Flichy, University Marne la Vallée, Jean-Michel Salaün, University of Montréal, EBSI); and "Will the future of art go digital?" (Norbert Corsino, choregraph, n+n corsino, Philippe Morel, architect, EZCT; Steve Sullivan, Industrial Light & Magic). As part of the celebrations, INRIA also organised an exhibition devoted to the history of information and communication science and technology. More than thirty demonstrations provided an overview of results today. The exhibition centred on an 'innovation village' offering scientific demonstrations, films and activities on a wide variety of subjects: health and biology, art and science, the virtual world, sustainable development, robotics, search engines, networks and sensors, languages, human-machine interaction, etc.